In the pantheon of food that smells worse than it tastes, the tradition of stinky tofu (yes, “stinky” is the adjective they went with) is more bark than bite. Found at street stalls and night markets throughout China and Taiwan, stinky tofu is often on the receiving end of hyperbole. I’ve heard it described as rotting garbage or decaying corpses, which is a colorful description, yes, but not really. Indeed, it creeps into your sinuses with the pungency of a wet sock, but plenty of foods have that smells bad/tastes great dynamic. Stinky tofu is like Limburger cheese or durian, which is to say, delicious beneath the stink. In fact, most stinky tofu is relatively mild in flavor. It’s the smell that gives it a semblance of character—brines vary and can include anything from fermented milk to shrimp—and once you settle into it, it’s not that bad. There are variations, of course, with some places priding themselves on stinky tofu so fermented that it looks like a dirty sponge, but it mostly just tastes saltier. 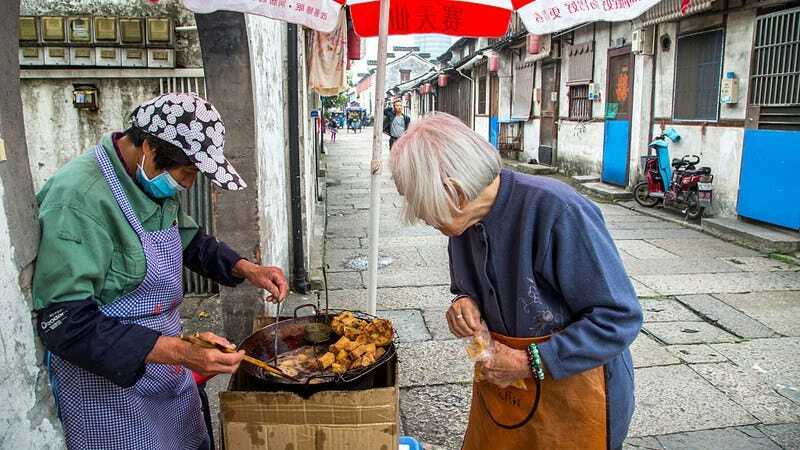 Stinky tofu has been around since the Qing dynasty, with the familiar origin story of accidental discovery. We truly owe a lot to these reckless gastronomers who see or smell something terrible and decide that the best course of action is to eat it. In Hong Kong, what few food stalls offer stinky tofu serve it up deep-fried. But there’s an even more pungent version: steamed stinky tofu. In fact, it’s doubly rank, so much so that wet markets have all but stopped serving the dish (a combination of a lack of consumer interest plus concerns about the hygiene of how it’s prepared). I had to look to Taiwan for steamed stinky tofu. (Most stinky tofu aficionados will agree that the Hong Kong version, eaten by Cantonese heathens with hoisin sauce, is inferior to its Taiwanese counterpart.) He Ji, a stinky tofu joint at the bustling Shida night market in Taipei, specializes in a mala stinky tofu hot pot, alongside the more palatable deep-fried stinky tofu. Mala is a Sichuan flavor element: “la” means spicy and “ma” refers to the addictive numbing and tingling sensation caused by Sichuan peppercorns. It’s a bit like chewing on Novocaine. The deep-fried tofu at He Ji has a light, crispy skin over a soft, slightly crumbly interior and comes with a light, salty-sweet sauce and pickled vegetables whose sourness feels like an elaboration on the fermented taste of the stinky tofu. It’s not the stinkiest tofu I’ve had, but it’s definitely much, much better than the tough slabs of stinky tofu you get at Hong Kong street-food stalls. In Taipei, you can also get barbecued stinky tofu slathered with condiments—sweet pickled vegetables, funky chili sauces, bamboo shoots—but all of the extra accouterments diminish the best part about it: the stink, at which point it’s just eating regular tofu, and where’s the novelty in that?